The crisis of plastic in our environments has been highly publicised for several years now. Major organisations, businesses and the government are making moves to address the over consumption of plastic in our society. The Plastic Free Communities initiative is a grassroots movement to push the over-use of plastic onto the public agenda and also into the political arena. It is also a campaign which Cornwall has taken ownership of, with Cornish residents, businesses and organisations at the forefront of highlighting and finding solutions to dealing with the issue of plastic on our beaches and seas. We are more aware and emotionally attached to the issue in Cornwall with many Cornish residents taking it upon themselves to clean rubbish from the beaches, create phone apps where you can earn reward points for cleaning plastic from beaches (Tidal Revival app), become the first Plastic-Free town in the UK (Penzance) as well as support established campaign groups such as the Cornwall Plastic Coalition (set up 12 years ago), #2minutebeachclean, The Final Straw and of course Surfers Against Sewage (SAS). 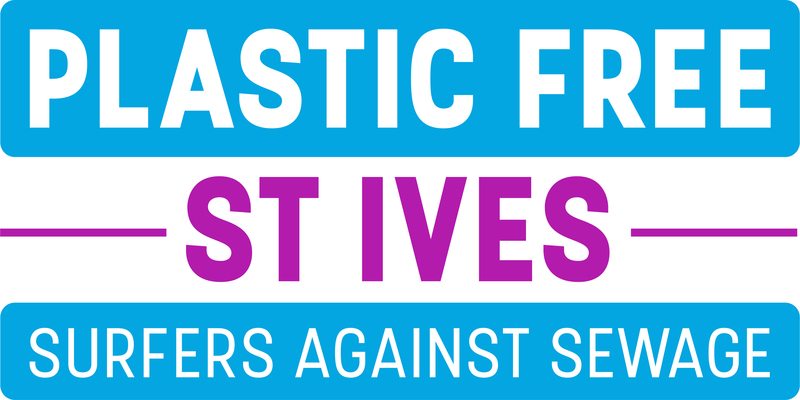 The Plastic-Free campaign we have set-up in St Ives, which is part of the wider Surfers Against Sewage Plastic-Free Communities initiative, is an accreditation scheme whereby a City, Town, Village (or community) can earn Plastic-Free status by taking steps to minimise its plastic consumption and therefore its impact on our seas and oceans. Getting the Plastic-Free status is not about eradicating all plastic from our lives: Plastic is an important material and has considerable uses that benefit society. It is the avoidable and single-use plastic items that the campaign aims to reduce and ideally eliminate. Gaining the Plastic-Free accreditation is only the first step that the campaign group has in store for St Ives; another idea is to eventually include St Ives in the refill.org network. To gain Plastic-Free status St Ives has to meet five objectives. Once we feel we’ve met all five objectives we’ll make an application to SAS who will review our campaign and outcomes, if they then feel we have met all the objectives to their standards they will award the town Plastic-Free accreditation. We have met 3 of the 5 objectives so far and hope to meet the others and gain accreditation by Summer 2019. For a local business to support our campaign and become a Plastic Free Champion they will have to eliminate at least 3 avoidable, single-use plastics from their business operations. Once they have signed up to this they will receive a window sticker and poster to denote their commitment. One of the great things about talking to local businesses is that we came to realise that many (if not most) of the businesses that we were speaking were already looking at reducing their plastic usage if not already having taken steps to do so. Very little persuasion was needed on our part for many businesses to be eligible to become a supporting member of the campaign and on many occasions businesses were coming to us asking what they could do rather than us courting them. This reflects amazingly well on the businesses of the town although it’s not wholly surprising considering our proximity to the ocean. We wish for this to be a community campaign involving the whole town and for St Ives to become a leader in sustainable tourism, reducing the impact of our activities on our beautiful coastlines while generating some good PR. Everyone who takes part in this campaign should get the recognition they deserve, from the resident who picked up a plastic bottle on the way to work, to the business who invested a lot of time and money eradicating all plastic from their operations. It’s also important to point out that the plastic solution we are seeking is just one element of the whole environmental campaign. This particular campaign looks to reduce the harmful effects that plastic has on the marine (and land) environment, however this does not mean we should forget the other very important environmental concerns such as the amount of carbon in our atmosphere which is hastening climate change. As a campaign group looking to reduce the harm to our marine environment we wish do not wish to see the acidification of our oceans caused by the warming of the planet. Let’s continue to focus on removing the over-use of plastic from our lives, but also not lose sight of the on-going battle with climate change. Little steps make a huge difference; we just have to make a few painless, small changes in our lives.